Written by an architect who has been designing and building affordable housing for thirty years, this well-illustrated book is both a call to create well-designed places for the homeless and a review of innovative and successful building designs that now serve diverse communities across the United States. Sam Davis argues for safe and functional architectural designs and programs that symbolically reintegrate the homeless into society in buildings that offer beauty, security, and hope to those most in need. Davis presents a new perspective, considering the personal concerns of the homeless, the social costs of homelessness, and organizational and design issues. He examines problems of community fit and site planning, building design and organization, and interior layout and suggests how to weigh costs and optimize expenditures. He asks and answers a range of challenging questions: What is possible and desirable when designing a new facility for the homeless? Should it be elegant or unassuming? What types of spaces should be included? How should it look and what should it feel like? Should it be more like a house or more like a dormitory? What is the proper balance between function, quality of construction, and architectural delight? Designing for the Homeless recounts how various communities have addressed the problem of housing the homeless, beginning with one of the most ambitious plans, the St. Vincent de Paul Village in San Diego, which opened in 1987. Davis vividly recounts the plight of those who become homeless. 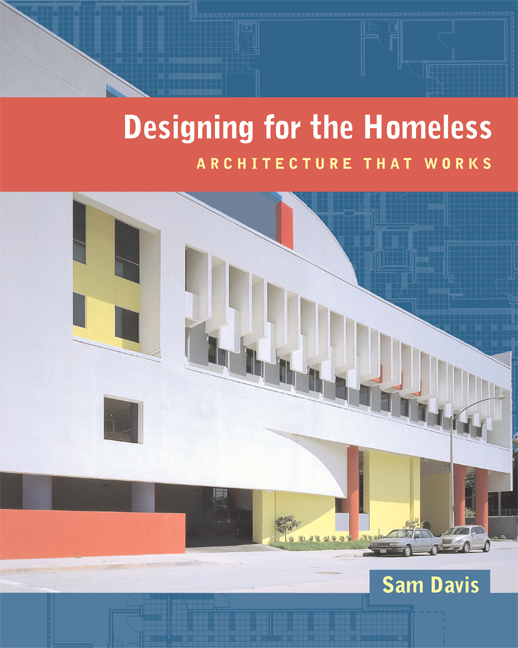 His practical knowledge, familiarity with solutions to date, and vision for the future—all expressed clearly and convincingly—make this innovative book an indispensable resource for architects, public policy analysts, and anyone concerned about housing the homeless. Sam Davis is Professor of Architecture at the University of California, Berkeley. He is the author of The Architecture of Affordable Housing (California, 1995) and the editor of The Form of Housing (1977).